I went to an event that was a curious conversation about political philosophy in the context of a university organised event in Parramatta. Joe Hockey hasn’t changed much over the last two years. On this May Day that has passed, the University of Western Sydney’s Whitlam Institute organised a political forum called It’s My Party, as a part of the Behind the Lines exhibition that is being hosted at Parramatta’s Riverside Theatres. Labor’s John Faulkner, the Liberals’ Joe Hockey and the Greens’ Bob Brown were invited to outlay the underlying philosophies of their respective parties. The audience were then invited to ask questions about those philosophies afterwards. Q and A without the mind numbing talking points, in other words. John Faulkner gave an entertaining history of the ALP, saying that it wasn’t really one event, group or person that started the ALP, it was more a spontaneous growth of wildflowers across the country. That underlined his main point about the ALP, that it is made up from a variety of people from a variety of backgrounds and will continue to have that diversity of people and views. 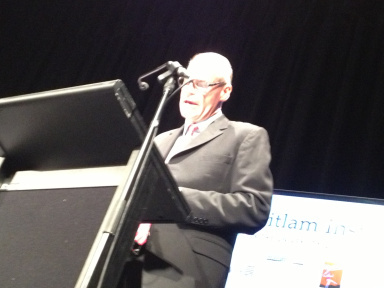 The other main strain from his speech was the concept of fairness that always underlines the main belief of the ALP – and its relationship to workers’ rights. It was from this framework that he stated his bald condemnation of those that used the Labor Party for their own selfish ends, such as Eddie Obeid and Ian McDonald, showing that the ALP was under threat from such operatives and the need for vigilance as the party lived on. It was a solid speech, encompassing the beliefs of the ALP in a manner that befitted the brief of the forum – that this was about the philosophies and histories of the parties. 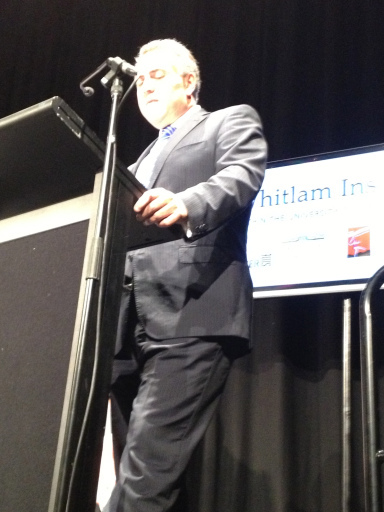 We then had Joe Hockey come to the stage. He took a considerably different approach to Faulkner, not particularly focusing on the origins of the conservative / liberalist past of the country, except a passing glib comment about the Australian Women’s National League being able to negotiate with Bob Menzies. Not mentioned was the UAP, nor the Menzies Liberalism of the 1940s – 70s. And certainly no Malcolm Fraser. What was mentioned was Margaret Thatcher. Hockey quoted extensively from Thatcher when talking about the Australian Liberal Party, which was very illuminating. That is why Hockey’s speech focused heavily on the idea of the individual being provided with opportunities – that a nation should be able to provide anyone with the opportunity to be a success. To this end, he provided a couple of searing images – that of people running in a race and the idea that we should not have a “safety net”, more a “safety trampoline”, propelling welfare recipients back to being productive members of society. It maybe shouldn’t have surprised me to see this vision of a neoliberal, economy centred Liberal Party that has only existed in more recent times – Hockey became an MP when John Howard came to power in 1996. He is the classic example of how John Howard and his fellow travellers transformed the modern Federal Liberals to being a group focused on the idea of having small government that is there to foster business growth, rather than a party supporting a variety institutions, groupings and individuals. We then had Bob Brown talk about the ecological basis of the Greens – having people focus on the origins of the word ecology – protecting homes, neighbourhoods, communities rather than just the economy. This idea of an economically sensible Green party, dedicated to finding solutions to future problems before they become too expensive to fix was a core idea Brown propagated through his speech. Brown went through the history of the Green movement, discussing Jack Mundey’s Green bans and the founding of Die Grunen in Germany. It was then that Brown brought out the photos of what the Greens are dedicated to protect. He also spoke of how Liberal and Labor Governments are working to stop protests in Tasmania in relation to logging in Bruny Island. 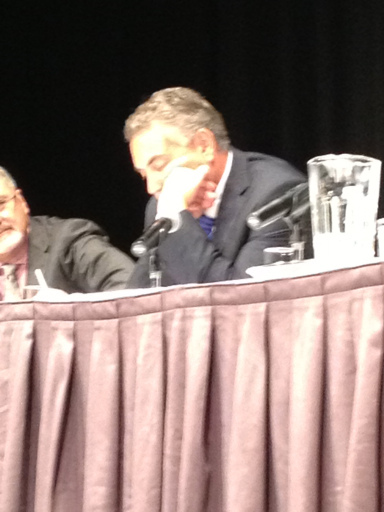 Brown also talked about his great post – parliamentary dream of a World Government. 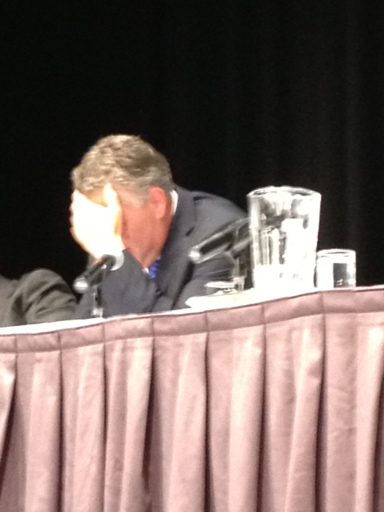 When Brown got out the photos, this was Joe Hockey’s reaction. The other two didn’t show that kind of regard when Hockey spoke. Maybe Hockey was thinking about the dinner he’d had before the event, where diners could overhear the Federal candidate for Parramatta telling him about Tony Abbott’s great popularity in the area and the need for a new stadium for the successful Wanderers. Or maybe the quick getaway he was to make after the event. It was then time for questions and answers. There were a range of interesting questions, as well as some partisan ones. There was a question from me about the matter of declining membership in all parties. John Faulkner’s answer was unsurprisingly blunt and revealing – and spawned the only article in the Sydney papers about the event the next day. He presented a pessimistic view, saying that he believed the ALP didn’t offer a reason to join currently and that it needed to look for those reasons. Brown answered with a similar answer to Faulkner in terms of giving people a reason to join. Hockey’s answer, however, reflected the nature of Hockey’s style all night. He said the Liberal Party “didn’t have that problem”. This was news to those of us involved in Western Sydney politics that know of declining Liberal Party membership and the difficulties had in finding booth workers on election day for all parties. Hockey also cited the Peter King / Malcolm Turnbull preselection battle in Wentworth as an great example of “party engagement” – that having 10% of the seat joining the party for that battle was a great thing. I noted with interest that it wasn’t a Western Sydney example he cited. The questions also took a interesting trip when a young member of the audience asked Hockey to define what “opportunities” he was talking about, in terms of society being able to provide them. His answer included the phrase “you tell me!”. Overall, however, despite having some partisan triviality and play fighting, it was unusual in terms of political forums, in that it was a discussion of ideas rather than petty point scoring. Not one boat was mentioned, for example. It was also unusual because it featured a Green. It is a pity we will not see such a discussion conducted by the current leaders of the three parties. Instead, it will be the same empty dreck. AusOpinion Reblogged 9 – The Old is New Again – The United Australia Party Reborn?